Rex and Melissa Pemberton have done it again! Their uncanny ability to touch the lives of others has extended to Ghana, West Africa. Teaming up with the “Medicine On The Move” project, Rex’s RPMP Media has finished filming “The Calling,” an inspirational story following the Porter family of Ghana. This incredible family has devoted their lives to the people of West Africa and aviation. Medicine On The Move transports educators specializing in general healthcare, basic first aid, hygiene, and disease prevention to communities which were previously beyond the reach of ground-based aid agencies. Rex recently posted that “The inability to access even basic modern health care affects millions in West Africa. Often critically ill or injured patients receive no medical assistance and frequently succumb to illness that can be easily treated.” RPMP Media has won countless awards for their film work, including the NorCal Free Flight Film Festival in San Francisco, the Boulder International Film Festival, and more. We are all extremely excited to see the outcome of his latest work. Rex is well known around the world as a motivational speaker, and his mind-blowing extreme aviation exhibitions. As many of you know, he is also a Team BlackHawk Paramotor pilot and is helping extend the reach of this amazing sport to all parts of the globe. To find out more about Rex Pemberton or his latest endeavors, please visit http://www.rexpemberton.com/. To watch the latest video covering this journey into Africa, please click on this link: http://vimeo.com/21946586. 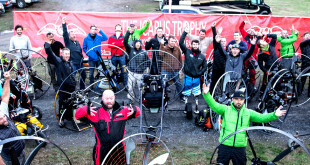 Previous BlackHawk Paramotor Seminar is a HIT at REI Sporting Goods!